"I'd gladly sell my soul to Satan for a year of freedom," cries Rosamond Vivian to her callous grandfather. A brooding stranger seduces her from the remote island onto his yacht. Trapped in a web of intrigue, cruelty, and deceit, she flees to Italy, France, Germany, from Paris garret to mental asylum, from convent to chateau - stalked by obsessed Phillip Tempest. Two years before Little Women, serialized in a magazine under the alias A.M. Barnard in 1866, this was buried among the author's papers over a century. Here is a tale of love and love lost. Of good verses evil. Of an angel and a devil. Be forewarned, this is quite a departure for our beloved Louisa May Alcott, if you're wanting another great American novel such as Little Women – with it's quaintness, happiness, and steadfastness in family and sisterly love. 'Love Chase' is much darker and more dramatic. In fact, it was so sensational that even though Louisa's publisher asked her for a novel with “absorbingly interesting” cliffhangers, he couldn't accept this product of her imagination and print such a scandalous story... In fact, it remained unpublished for more than a hundred years after her death, until chance landed it into the hands of just the right editor who would dust the cobwebs off the story and bring it forth to the public in 1995. Rosamond Vivian, a sheltered 18-year-old who lives with her uncaring grandfather in East England, has finally found a bit of adventure... in the shape of a visitor to their little island, a visitor named Mr. Tempest. Away naive Rosamond is swept, in a flurry of frivolous fun and deceit. Rosamond takes it upon herself to turn her lover upon the right path in life. Tempest freely warns her in the first days of their companionship that he is not a good man; he certainly couldn't be confused with a saint. I did love her response, “No, everything is possible with God. I do not give you up. I pity you, and love can work miracles, so I shall still hope and work.” Girl, you get an A for effort, because that's a tall order. This life of adventure with an all-too-charming man begins to take its toll on Rosamond. She is unable to bear the days half so cheerily as he strives to defeat her in emotional games. He toys with her mind, and with her very being, her soul... the chase is on. It's a chase that was destined from its misguided start to end in tragedy of some kind. Note to the discerning reader: There's so many topics covered in this book, such as suicide, murder, divorce, bigamy, deep obsession, and one too many other dark secrets. To be honest though, I didn't feel that any of this was too “sensational”, especially for modern readers. To me, this novel certainly feel like an epic piece of refined literature such as 'The Hunchback of Notre Dame' (without Hugo's additional inner essays, thank goodness), combined with the intensity and intrigue of a Gothic classic such as 'Rebecca', and a unique cast of characters such as would be found in any Dickens novel. 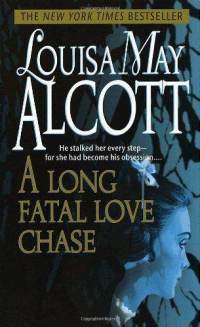 Don't overlook 'Love Chase' simply because it is one of Alcott's lesser known publications, as it ranks well with these other classics in terms of pathos, and a unique perspective on human nature. This is a story where our American authoress takes on the task of painting a colorful European landscape, creating a heroine who lives in England, not the States. In fact, Louisa, I'm sure, used much inspiration from her own European trips to vividly tell us all about some of the other countries whose shores are touched in this roller-coaster tale, as the love chase bounds from location to location. Overall? Certainly it felt thrilling and suspenseful while each chapter passed. What fun it truly was to discover a different facet of Louisa's writing skill. Reading age level: This is considered to be one of the few “adult” novels that Alcott wrote. “What now, my little bookworm?” he asked, as he threw himself down on the couch near the table where she sat reading and lit his cigar always laid ready for him. 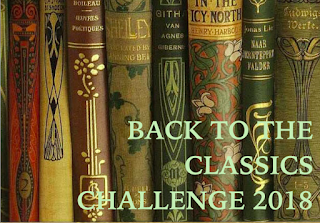 My 2nd book is complete for the Louisa May Alcott reading challenge. This is book #5 for me in the Back to the Classics 2018 challenge. My thoughts exactly! I also want to read The Inheritance which is an early novella, I think it's what Jo would have been writing. I actually haven't read Little Women since I was a kid so I should really read it again. Karen, The Inheritance is one that I want to read too -- maybe I'll add it to my 2019 booklist for next June when the challenge comes around again. :) Oh, and I ALWAYS recommend a re-read of Little Women to anyone that I can. It's a book that grows with you, no matter what stage of life you're in! I read this a year ago and loved it. Kai, I'm glad you enjoyed it too. It's definitely interesting as an Alcott book. Have you tried similar suspense fiction by author Daphne du Maurier, such as her novel Rebecca? I love Gothic romance and this is the first time I hear about this book of Louisa May Alcott! I really want to read this darker writing because I find it fascinating when writers are able to get through so many different styles. Andreea, thanks for stopping by again to comment. 'Love Chase' is definitely so different from what I've experienced previously in reading Miss Alcott's books... and yet... it's so intriguing! I love seeing this side of her writing. I am so glad you reviewed this one. I forgot about it. I was given this as a Christmas gift when it first published and haven't picked it up. You've renewed my interest. Thanks! And, yay for reading a book for your challenge. You should totally read it! This book has been holding up a spot in your TBR pile for a while now, I daresay. :) I found the story to be pretty intriguing, and I hope you will too. Thanks for commenting! I didn't know this book existed. Thanks so much for bringing it to my attention!! It does sound like it would have been scandalous for the time---such an interesting perspective! Oooh I'm definitely going to be checking this one out - your descriptions have me hooked, and I'm very curious as to how I'll perceive Louisa May Alcott's writing in this style. I remember someone from my Jane Austen book group who always suggested we read it (because of course you can only discuss so much JA, we had to expand to related works and other classic women writers). It's totally not what you'd expect but I do love a good Victorian Sensation novel. Oooh, a J.A. reading group would be fun, I'm sure. Anyways, I think you'd enjoy trying some of Louisa's more sensational stories -- it's at least worth a try. Wow! This does sound interesting. I've read little women and enjoyed it. Have you read any other Victorian sensation novels? Wilkie Collins is really good, and I love Mary Elizabeth Braddon -- Lady Audley's Secret is really fun, very dramatic and over the top. Thank you for the suggestions -- it means a lot to me! I've actually never read either of those authors you mentioned. I'm very excited to dive into their works now.